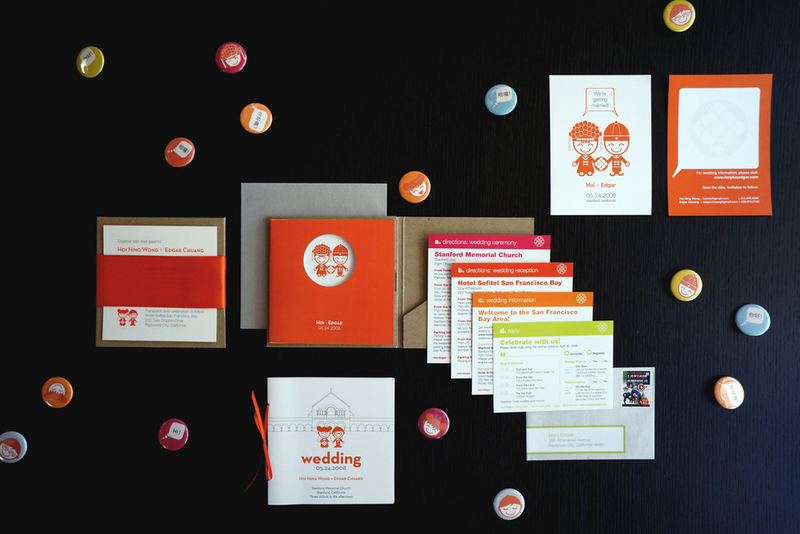 Our wedding allowed me to design a highly personalized suite of wedding stationery for our guests, inspired by color and playfulness. Since our wedding took place over Memorial Day weekend and had guests from near and afar, we also created a simple guidebook with 5 "Perfect Day" suggestions of our favorite places in the Bay Area. Download the guidebook PDF here. Our wedding allowed me to design a highly personalized suite of wedding stationery for our guests, inspired by color and playfulness. It also gave me an opportunity to experiment with different printing processes, from spot vanish offset printing to hand silkscreening on the Japanese Gocco machine. Since our wedding took place over Memorial Day weekend and had guests from near and afar, we created a simple guidebook with 5 "Perfect Day" suggestions of our favorite places in the Bay Area to add something special to our wedding packet. Download the guidebook PDF here.